Teledyne Hastings is proud to release our newest, most advanced, line of digital flow meters and flow controllers - the 300 Vue. In this blog, we will discuss the three types of Input/Output (I/O) that can be used with the 300 Vue. These are: Analog, Digital, and Touchscreen Display. The 300 Vue is very flexible. The instrument can be configured to give and receive analog signals. 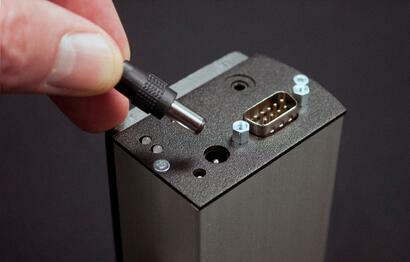 For example, the 300 Vue can use 0-5 VDC, 0-10 VDC, 4-20 mA, or 0-20 mA. Let’s take a look at a 300 Vue flow controller which has been setup to have a full scale flow rate of 100 sccm and has 0-5 VDC I/O. In the case of a flow controller, there are two analog voltage signals that we need to understand. The first is the flow output signal. In our example (0-5 VDC), 5 VDC corresponds to 100% of the full scale of the flow controller. The relationship between the voltage output signal and flow rate is linear. So, if we have an output of 1 VDC from the 300 Vue, then we would have a flow rate of 20% of full scale which corresponds to 20 sccm (20% * 100 sccm = 20 sccm). Correspondingly, in our example, the 300 Vue will accept an analog command signal between 0 and 5 VDC. Again, 5VDC corresponds to 100% command signal. The command signal tells the flow controller how to set the flow rate. So, if we wanted the flow rate to be 75 sccm, we would provide a 3.75 VDC command voltage (75 sccm* (5 VDC/100 SCCM) = 3.75 VDC). One last comment before we move on. Analog I/O is still used in many applications. Older flow power supplies and PLC’s often utilize analog I/O. 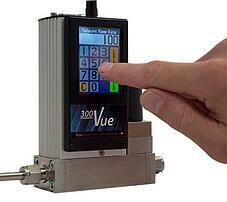 The 300 Vue flow instrument makes it easy to integrate into these systems. 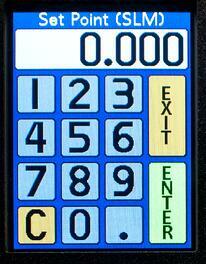 The 300 Vue can provide digital I/O via RS232 or RS485. Connection to the digital port is made via the micro USB connector or the small bayonet-style connector. Let’s take a quick look at an RS232 command for the 300 Vue. If we send “F”, the 300 Vue will respond with the flow rate. Simple - right? Now in the case of a flow controller, we will want to be able to send a command signal to tell the flow controller how to set the flow rate. One way to do this is to use V5, the “Setpoint”. The Setpoint Command is simply the flow rate expressed as a percent of the flow controller’s full scale. So, “V5=100” will set the flow rate to 100% of full scale. You can also use V4 which sends the command in the given units, as opposed to % of full scale. Digital communication with the 300 Vue can be utilized in a few different ways. First, you can use our free user software which can be obtained from our website. If you want to see all of the capability (including flow data logging) you can watch this short “How To” video. Next, many of our digital flow controller users write their own code using LabView. By working with the “F” and the “V5= “, or “V4= “ commands, the user can easily read and control the flow rate in their application. Here at Teledyne, we often use TeraTerm for communicating with our digital flow instruments. Click to visit TeraTerm website for more information. TeraTerm is nice because it is open source (free) yet it is very powerful. I also like the fact that TeraTerm allows the user to save and restore a communication set up file. In other words, once you have a TeraTerm “ini” file working, you can save it so that you don’t have to reconfigure the settings each time you start up the program. If you have TeraTerm and would like a copy of my setup file for the 300 Vue, just send me an email. Ok, we’ve talked a little bit about analog I/O and digital communications. Now, let’s explore the coolest feature of the 300 Vue – the color touchscreen display. 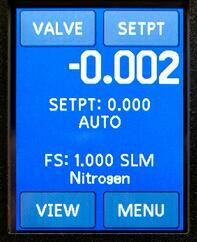 With the touchscreen display, it is very easy to see and control the flow rate. First, we should point out that the 300 Vue flow instrument is very easy to power up; you just plug in the connector and you are in control. Now, to change the flow setpoint or command signal we touch Setpoint and we see the numeric keypad screen as shown below. Changing the setpoint is easy… you just type the value you want and hit ENTER. The display then returns to showing the flow rate. The 300 Vue is very flexible with respect to Inputs and Outputs. If you have questions about I/O, our applications engineers are always standing by and ready to help. You can reach us at hastings_instruments@teledyne.com or by calling 1-800-950-2468.